I met Abdul today. He is the hot dog man outside of River Run Playground at 83rd Street in Riverside Park. I’ve bought probably $100 worth of hot dogs and ice cream bars for the boys in recent months from him, though my total might be closer to $500. Not sure. I finally decided to ask him his name. Don’t know why today as opposed to any other day. 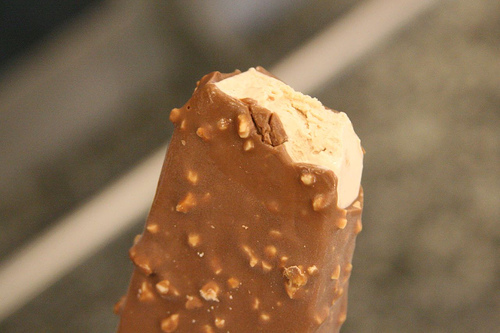 I gave his partner a hard time last weekend for selling me a “Candy Center Crunch” bar – like a chocolate-covered vanilla ice cream bar with a chocolate candy center; your basic heart attack for children – and it was frozen through and as hard as granite. I asked for my money back, and the man convinced me to take another ice cream choice – this one soft as gypsum rather than somewhere between feldspar and quartz as was the other. Abdul asked if I was American, and where I was born. He grinned as he usually does when he sees us coming, but this time his grin was wider when he described them. I noticed the details in the rough yellow and brown stains between his teeth in the bottom row, which always showed more than the top row. But I looked into the eyes of a father for the first time, not the co-conspirator who sold my son a rock for $2.